The stock price for a French healthcare company plunged on Monday following lackluster results from its experimental peanut allergy patch for kids, while the share price for a California competitor surged in response. DBV Technologies (DBVT) revealed on Friday that late-stage clinical trials for its patch vaccine, Viaskin Peanut, missed the primary endpoint. That's the bar that typically means the difference between a marketable drug and one that isn't. The company's stock price plummeted more than 50% on Monday. At the same time, the stock price for Aimmune Therapeutics (AIMT) surged 33%. The biopharm company in the San Francisco suburb Brisbane announced last week that it will present the results of its own late-stage clinical trials for a kid's peanut allergy treatment at healthcare conferences in the next few days. Aimmune's experimental treatment is a pill called AR101. Peanuts can cause anaphylactic shock, a life-threatening reaction, in people who are allergic to them, particularly children. Viaskin is an electrostatic patch that works by administering the allergen directly on the skin, according to the company. AR101 is also designed to work like a vaccine, with patients taking the drug at a doctor's office every two weeks over a 20-week period to overcome their allergies to peanuts. Dr. Charles Duncan, a research analyst at investment bank PiperJaffray, said in a published report last week that Aimmune is undervalued, based on his confidence in AR101. Results for late-stage testing regarding that drug are expected to be released in the first quarter of 2018. Meanwhile, DBV Technologies, which is based in the Parisian suburb of Montrouge, said it's still working to develop the drug and submit it to the U.S. Food and Drug Administration for potential approval. Viaskin Peanut "shows significant therapeutic promise in the peanut-allergic population, where there is a high unmet medical need and no approved treatments," Dr. Pierre-Henri Benhamou, CEO of DBV Technologies, said in a statement. 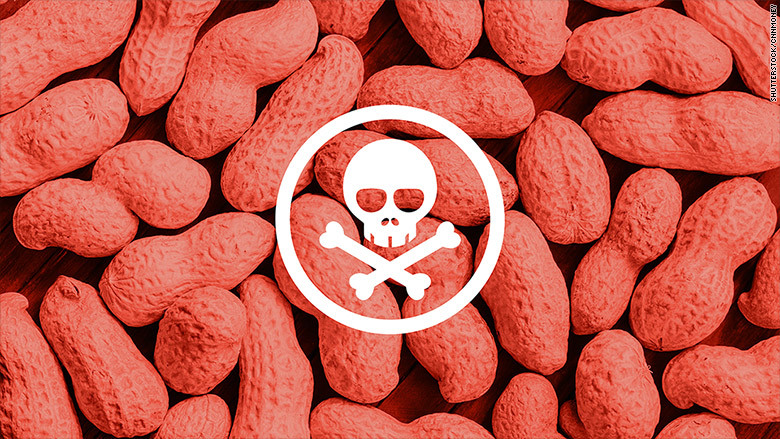 The FDA will most likely require another late-stage clinical trial for Viaskin Peanut, according to Dr. Liana Moussatos, an analyst for WebBush. She said that Aimmune's drug is right behind it, in terms of testing, and the two drugs would be direct competitors if they both end up on the market. David Schilansky, chief operating officer for DBV Technologies, told CNNMoney that the clinical trail results for Viaskin Peanut are still strong, having only barely missed the endpoint, and his company plans to submit those results to the FDA. "We feel that we have a robust set of data," he said. "We intend to go and discuss with the FDA about the way forward." DBV is also working on Viaskin products for milk and egg allergies.